ON AN uneventful day in 1975, Goh Kuan Meng, then just 21 years old, created two refreshments. Thirty-five years on, those two creations have become a staple at most ice kacang or ABC stalls in Kuching, even though the creator remains relatively unknown and continues on a six-day work week doing what he does best. One of his creations – a mix of longans, pineapples, mango juice and milk – he called White Lady. Bustling: The Hui Sing Hawker Centre is a place for locals to go for a quick bite. “The ingredients came to me first. I had everything in a cup and I liked the taste and colours. After this, the name came naturally,” said Goh. But Goh sold more than a few. Initially priced at RM1, Goh reckoned that he had sold thousands of his White Lady in the past 35 years. Despite the hawker’s modesty, it was immediately clear that Goh had put in a lot of thought in coming up with his ideas. 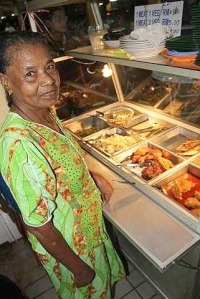 Fresh every day: Amachi with her north Indian cuisine laid out. For his second creation, Goh wanted something light and refreshing that people would want on a hot sunny afternoon. 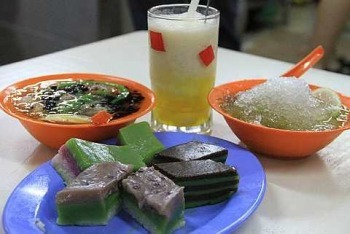 Into a bowl of crushed ice (in 1975), Goh added pineapples, longan, canlut (green jelly made of a pandan extract, also known as cendol), grass jelly and lemon slices. “I called it Mattahorn. I don’t know if that’s the correct spelling but that’s how I’ve always spelt it,” he said. Goh was thinking of Matterhorn, a high icy mountain on the Swiss-Italian border, which this refreshment resembled. Take a spoonful of one of Goh’s creations and you’ll understand why both have become popular. Mouth-watering: (Clockwise from top left) Melted Mattahorn, White Lady, newlymade Mattahorn and kuih. In Kuching, you can order variations of White Lady and Mattahorn at cheap eateries from Hui Sing Garden to Kubah Ria. “I’ve never minded the imitations. It’s just like a compliment to me,” he said. Goh, like the 15 other hawkers at Hui Sing Hawker Centre, first operated on an empty plot at Palm Road opposite the now-defunct Miramar Cinema. In mid-1994, they were relocated and joined by four other hawkers, adding to Hui Sing’s already bustling commercial space. These hawkers have never complained or looked back. From selling food next to Palm Road’s huge storm drains, the new food stalls were clean and welcoming in comparison. The centre is a hangout that only locals know about. Tucked away amid four rows of shoplots and without much amenities to speak of, the centre is reminiscent of a busy night market. Never mind luxuries like air-conditioning. Eating and sweating (like the hawkers) makes the experience. It is eating out in a natural state. Business has been so good that some hawkers have managed to expand. Sim Song Ngan’s famous satay has branched out and acquired a fan base of its own. 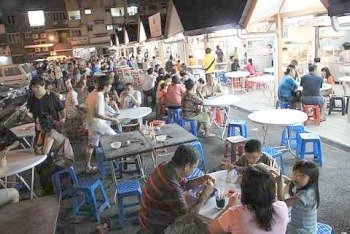 On any given night, the Hui Sing Hawker Centre attracts the kind of loyal clientele that any business would be proud of. They are locals who return time and again for a quick bite. The centre’s regular customers comprise entire families, young working adults, senior citizens and even Kuching City South mayor James Chan. “I love this place,” Chan told StarMetro recently. “I often come for the kueh chap and drinks. At other times, I bring my own seafood for them to cook. But one thing that irks me is the lack of tourists. In my opinion, the centre is under-promoted. “In tourist guidebooks, the recommended places to eat are always the same few restaurants. Airline in-flight magazines ignore places like this as well. Why? I think Hui Sing offers good food and a cultural mix that is as exotic as other cities like Kuala Lumpur and Singapore,” he said. The mayor has a point. It is a shame that ingenuity like Goh’s is not better known outside of Kuching. The centre’s food comes in big and small portions, bold and simple flavours, and there is absolutely none of the pretence often felt at up-scale restaurants. A kopi o kosong peng is simply iced coffee without sugar or milk. It is not called Chilled Long-Black. The size of your drink is either big or small, not tall, grande or venti. The real reason why locals keep going to places like the centre is because every mouthful is a reminder of old Kuching. The place is a winning recipe. On an empty plot, add car parks, food stalls, chairs and tables, and let it blend in the open air with tried-and-tested food. This is something impossible to replicate in any modern shopping mall or shoplot.